Steven Anderson is a tattoo artist and entrepreneur who has lived and worked in the Fox Valley since 2007. After pursuing a bachelors degree in English literature and east Asian language and culture at the University of Wisconsin - Madison, Steven completed his tattoo apprenticeship at one of Wisconsin's oldest tattoo institutions, Steve's Tattoo. The opportunity to work at Steve's Tattoo, Oshkosh was what bought him to the valley in the Fall of 2007. There he focused on traditional Western and Japanese tattoo styles, while also focusing on script lettering tattoo design. With his business partner and wife, Carrie Olson, he opened the 920 Tattoo Company in downtown Oshkosh in 2012. To give back to the community, Steven became a Freemason in the Fall of 2012, and continues to enjoy serving his community with his fraternity. In his free time, Steven is an avid reader, dog lover, and traveler. Molly apprenticed under Carrie Olson starting in November of 2015. After starting, it didn't take her long to realize that this was were she wanted to be. Her apprenticeship was exciting and Carrie took her time to mold and develop her skills and swiftness. Not before long, she was piercing on her own and learning new tricks along the way. Her favorite thing about being a piercer is not the piercing itself, it is the transformation that it can give you. Whether it's a mile stone such as a birthday, graduation, or claiming self love by enhancing the feature you dislike, the look in people's eyes when they see their new adornment is the reason she pierces. Adornment and modification are a necessary tool to help you grow and flourish, and she loves being that person that is able to help get people closer to their true selves. If you can't make the Christmas tree bigger, ya might as well decorate it! Carrie Olson is a tattoo artist, painter, and community organizer. Lifelong creative, she’s been illustrating since childhood, and has never stopped. Originally from Baraboo, WI, Carrie served a tattoo apprenticeship after completing high school. Her training at Point Blank Tattoo, in the Wisconsin Dells, focused on mastering custom tattooing (a style where clients commission original artwork instead of simply picking a design off of the wall of the tattoo studio). Her teacher, a talented painter, encouraged her to approach her commissions as uniquely as possible, expressing her own artistic voice and vision. She later went on to continue her tattoo education at the one and only Steve’s Tattoo, in Madison, WI. There she continued to grow, learning about traditional western and Japanese tattoo styles under Steve Gold. 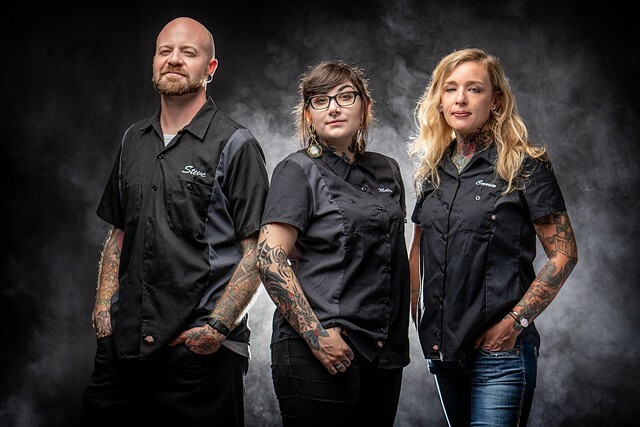 Having moved to the Fox Valley to work at another of Steve’s locations, in 2012 she partnered with her now husband, Steve Anderson, to open the 920 Tattoo Company, located in downtown Oshkosh, WI. Since beginning her entrepreneurial journey, she has gotten involved with the downtown business improvement district marketing group in Oshkosh, sponsoring and organizing many events, including the annual holiday parade as well as the Chalk Walk, one of Oshkosh’s largest youth and adult public art events. In her spare time, she enjoys hiking, reading, and spending time with her dogs.